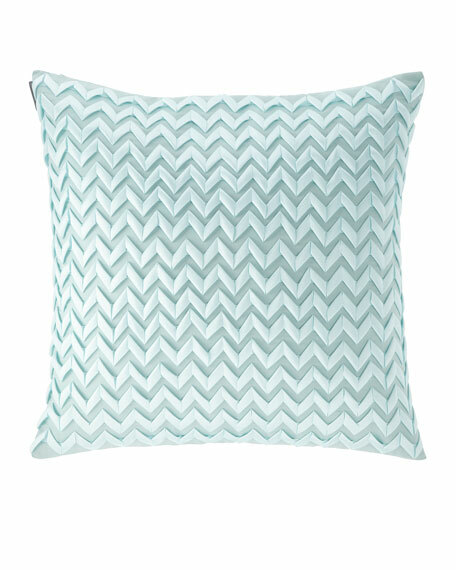 Lili Alessandra Chevron Pillow, 26"Sq. Made of a mix of polyester and polyester cotton fabrics. Feather/down insert. Dry clean. Zipper closure. 20"Sq. with 6" fringe. Made of a mix of polyester and polyester cotton fabrics. Feather/down insert. Dry clean. Zipper closure. 20"Sq. with 6" fringe. Made in the USA of imported materials. Made of linen with velvet applique detail. Velvet is cotton/viscose. Feather/down insert. 24"Sq. Machine wash. Imported.